Neocortex AI uses vision, grasping and motion control to give machines human-like flexibility at high speed. We provide supply chains complete automated material handling systems for high-mix, high-volume applications. Our technology, called Neocortex, enables automated systems to handle high item variability, part change-overs, and deformable objects without fixturing. The software platform is hardware and sensor independent, providing a tailored configuration for low cost. It is fast, reliable, and accurate, delivering trend-setting levels of performance. Typical pay back is less than 18 months. In addition to custom applications, Universal sells prefabricated industrial robot work cells that ship as complete systems. Called the Neocortex G2R (Goods to Robot) Cells, they are designed to drop into existing human work cells on the supply chain without reconfiguring the line. 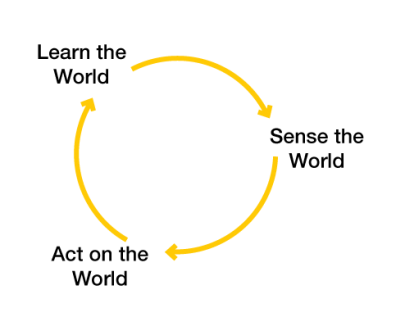 Learning happens where we interact with the world. Sensing combines with movement and memory, resulting in cognition. Neocortex closes the loop, coupling data with manipulation in real time.